Irving Rosenfeld (Christian Bale) runs cons. He runs cons off of his cons. When he meets Edith Greensley (Amy Adams), he brings her in on the action. The pair starts raking in money from people looking to get massive returns from banks in London. All of this comes crashing down when overly aggressive FBI agent Richie DiMaso (Bradley Cooper) busts them. In exchange for keeping them out of jail, DiMaso demands the scamming duo/lovers help him make 4 more busts. DiMaso is bent on catching the people who are tearing the country apart. As they begin lining up scams to nab other con artists, DiMaso keeps changing the terms of his deal. He wants bigger and bigger fish. His supervisor, Stoddard Thorsen (Louis C.K. ), a strictly by the books type of guy, does not approve. DiMaso goes over Stoddard’s head to get Stoddard’s boss’ approval on the project. Irving, Edith, and DiMaso set up a sting to catch New Jersey’s Mayor Carmine Polito (Jeremy Renner) as he plans to rebuild Atlantic City. When Irving’s unpredictable wife, Rosalyn (Jennifer Lawrence), is brought into the picture, the entire operation could be put in jeopardy. She is aware of what Irving and Edith have been up to, not on a “professional” level, but of Irving’s extracurricular activities. As the sting continues, the stakes grow higher. DiMaso and crew find themselves dealing with United States Congressmen and a notorious mobster. All the while, DiMaso is getting more brash and ambitious. Now, more than just jail time is on the line. They could find their lives in danger. Especially if Rosalyn can’t keep her mouth closed. “Some of these things happened.” Or so the movie states as it opens. American Hustle is a fun movie. The story is all over the place. And I mean that in a good way. Everyone has their own agenda, and they aren’t afraid to pursue it, no matter the cost. Everyone is lying to almost everyone else. It’s amazing that they are able to keep their stories straight. Bradley Cooper’s DiMaso seems how many young, gung-ho agents would be. Wanting to make a big bust to make a name for themselves. Get some glory. They do it under the guise of cleaning up the country, but it is really for their own gain and ego. Bradley’s energy is perfect for the part. His permed hair is icing on the cake. Oddly enough, he can pull this off. Louis C.K. is a great straight man to Bradley Cooper. He’s the frustrated boss trying to keep his agent in check, but instead, ends up being a punching bag while the brash DiMaso gets more and more obsessed with making a huge bust. This is probably one of my favorite Christian Bale performances. He’s the calm “business” man, who knows how to get what he wants. Bale is completely believable in this character. You can see the dedication to his craft, the love for his son, and eventually the fear for his life in his eyes. I love Jennifer Lawrence in these types of roles. Sure, she is great in The Hunger Games. There is no denying that. But when she plays these more unpredictable characters (see also Silver Linings Playbook), she really shines. It gives her more of a chance to show off her amazing skills. The explosive chemistry between these two is great. Amy Adams. What can I say about Amy Adams? This is definitely a departure from her typical roles. She is no longer the sweet and innocent girl. She is sultry, conniving, sly. And she pulls it off. Yet, there is still a glimpse of that girl who just wants to be loved hiding in the background. 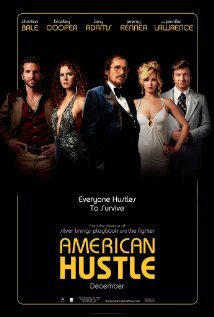 David Russell, who directed and co-wrote American Hustle provides us with an excellent story and brings it to life. (Coincidentally, he directed and wrote the screenplay for Silver Linings Playbook, which is equally as good. So good, in fact, that he brings most of the major players back for a reunion.) The twists and turns and cons on top of cons make for a funny and entertaining ride.